The namespace for all of the interfaces and objects associated with wrapping different SQLite providers. 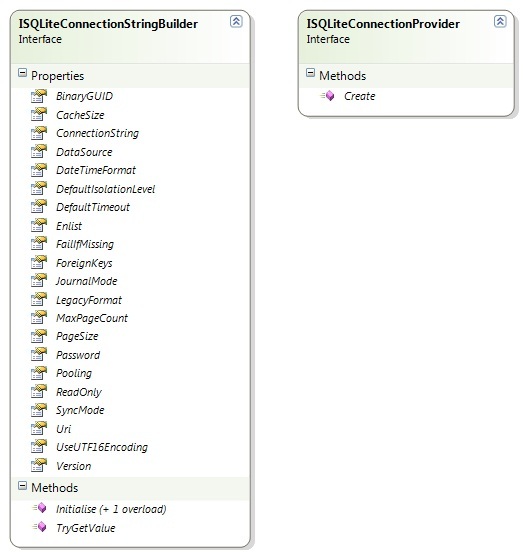 The interface for an object that can create an SQLite connection. The interface that wrappers around a provider's SQLiteConnectionStringBuilder must implement. The interface for objects that can wrap an SQLite exception. The wrapper version of the provider's SQLiteDateFormats enumeration. An enumeration of the different error codes that can be exposed in an ISQLiteException. The wrapped version of the provider's SQLiteJournalModeEnum enumeration. The wrapped version of the provider's SynchronizationModes enum. Up until version 1.1.2 of VRS the application bound directly to Robert Simpson's SQLite ADO.Net Provider. When the Mono version came along it used a Mono build from source of the provider. However under some Linux systems this was not very stable, so the new approach is to use the native Mono SQLite library when running under Mono. This wrapper only wraps the parts of SQLite used by VRS.